Acne is the result of oil or dead skin cells clogging pores or hair follicles, and back acne is actually very common. However, our hot and humid weather makes it worst. Our bodies produce a type of oil known as sebum. Made in glands connected to our hair follicles, the sebum will move from the glands up to the hair follicles to add moisture to our skin and hair. However, when there is more than enough sebum, coupled with dead skin cells, pimples will appear as a result. This build-up will clog the pores of our skin. Whiteheads are the result of the hair follicle wall swelling out. Blackheads form when the clogged pores are exposed to air. Back acne is actually very common. The back is prone to acne because the skin on the back is thicker and has larger pores compared to the face. These larger pores are easier to get clogged, and therefore acne breakouts on the back are common. Our back is usually covered with clothing, which traps oil and dirt. Tight clothing will rub the mixture of oil and dirt back onto the skin, and this will likely make the condition worst, especially in hot and humid weather. Moreover, it is hard for us to see and reach the afflicted back acne breakout areas on our back to apply topical acne treatment products. On top of that, excessive exposure to UV rays from the sun will damage cells and weaken skin, resulting in blemishes. Although sweating cools the body and rids it of toxins, the toxins still remain on top of the skin. Combined with the sun’s UV rays, the sebum, dirt and toxins all mix together, and undergo oxidation, which leads to the hardening of sebum, encouraging blackheads to form. We can prevent or reduce back acne through some simple lifestyle alterations. Firstly, change out of your workout clothes after exercising in the gym or sweating outdoors, and have a proper shower to clean away all the sweat and dirt. Make sure you wash your workout clothes after each session too. Use a medicated body wash which has salicylic acid to shower every day. Salicylic acid has anti-inflammatory properties, helps to exfoliate the skin and reduces oil build-up. This will help to take care of problem spots where the back acne always occurs. Use a gentle exfoliating scrub with ingredients such as salicylic acid to remove extra dirt and oils from your skin. This can help reduce the amount of dead skin that could clog pores. Long hair might add oil and dirt to the skin on your back, making back acne worst. Wash your hair regularly, and tie it up in a ponytail or bun when you exercise. Also, when washing your hair, rinse out the shampoo and conditioner thoroughly. Make sure the residue is not running down your back, especially from the conditioner. Wash your body after washing your hair to get rid of residue. Ingredients in these products can contribute to clogged pores. A topical cream that can be used to treat back acne is Adapalene, which belongs to the ‘retinoid’ class of medications. It decreases swelling and inflammation, and can lessen the number and severity of acne pimples. It also helps to heal pimples quickly. 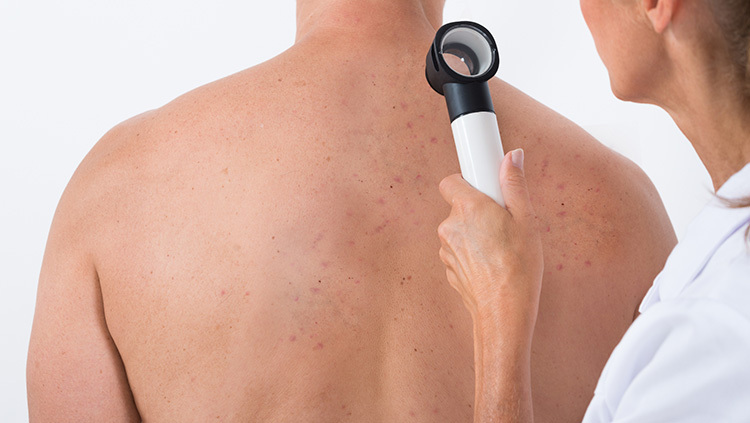 People afflicted with back acne can also seek in-clinic treatments such as chemical peel, microdermabrasion and phototherapy (light treatments). These treatments will help to unclog blocked pores, eliminate bacteria and excess sebum, brighten the skin, and refine skin texture, among other benefits. Chemical peel is suitable for men and women of all ages. It is used to remove the top layers of the skin by applying a peeling solution to the skin, which will result in your skin peeling naturally. This treatment is prescribed to remove dead skin cells on the surface. A fresh layer of skin will be revealed, which is usually smoother and healthier. There are other types of peels that can be used depending on the condition of your skin. The kind of treatment to be used will be determined by your doctor after an initial consultation. The strength of the peel and its effects can be adjusted. By applying several layers of the peel solution, the effect can be increased, but the necessity will largely depend on your skin type, situation and desired outcome. Whichever peel you choose, you should notice some improvement after each session. An example treatment is a combinative chemical peel treatment using salicylic acid and trichloroacetic acid (TCA), which is usually prescribed by a doctor. This treatment can help to reduce active acne, minimize acne scars and also strengthen the skin cells on the back. After the peeling treatment, LED Photomodulation therapy is used next to help neutralize the exfoliative effect from the chemical peel. This LED treatment will help to reduce skin inflammation, and soothe overactive skin conditions. Interested to know more about our latest aesthetic treatment packages, click the button below! Latest Aesthetic Packages!